A delightful display of the famous Moustiers faience pottery in the village of Moustiers Ste Marie in the Alpes de Haute region of Provence, France in Europe. 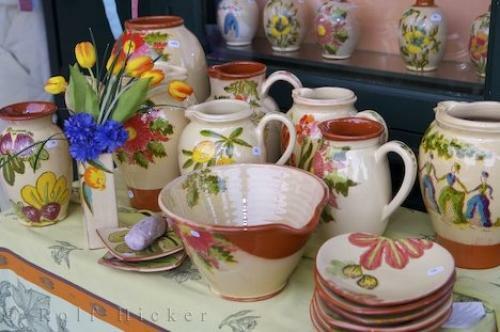 Photo of Moustiers faience pottery in the village Moustiers Ste Marie in Provence, France in Europe. ... The famous Moustiers faience pottery in a store, Poterie de Moustiers, in the village of Moustiers Ste Marie, Alpes de Haute, Provence, France, Europe. I photographed this photo with the digital SLR camera model Canon EOS-1Ds Mark II, aperture of f/5.6, exposure time of 1/60 sec. on ISO 100, as always I used a original Canon Lens, the focus lenght for this picture was 55mm.